Use Insight’s export function to write seismic or other volume data to text format. Note: Exporting to text is only applicable for single volume. Warning: Text formats are an inefficient way to store data and will be many times larger than the original format. Ensure that you have the disk space and resources available when exporting to text. 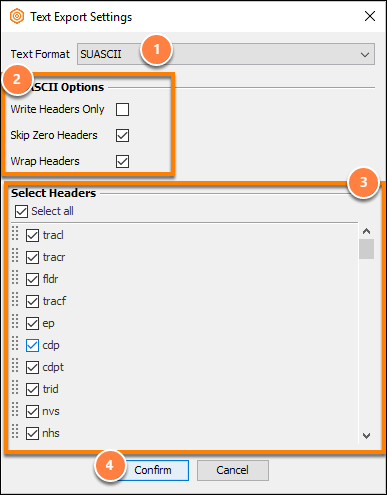 Click Configure Output to select the preferred header(s) to export. By default, all headers are selected. Click Confirm to accept the settings. Continue with the rest of the export settings shown in Exporting to DUGIO.